When your bestie is on a dairy-free diet, this presents a challenge when a recipe is so reliant upon butter and condensed milk! So for a special treat, I accepted the challenge to produce a Vegan version of my Salted Caramel Millionaire’s Shortbread. Please know that the caramel recipe is not 100% perfect yet – I will get there with a little more testing – but what it results in is an entirely delicious, if slightly messy, teatime treat. You’ll have to lick your fingers. You’ll love it. Pop all of the shortbread ingredients into a mixer and combine until one glorious lump of cookie dough. If you cannot source the semolina, you can substitute with flour but semolina does give the shortbread an amazing crunch. Press the dough into the bottom of your brownie tin, paying special attention to the edges and ensuring that it is nice and level on top. Prick the shortbread all over with a fork to prevent it puffing up in the oven. Bake for 35 minutes until golden then leave the tin to cool on a wire rack while you make the caramel. Put all of the caramel ingredients, with the exception of the salt, into a heavy saucepan and turn on to a high heat. You are going to think that I am insane – the margarine will float around in the coconut milk and look about as unappetising as it is possible to look. Eventually, the margarine and sugar will melt into the coconut milk and bubble nicely. You will need to bubble this concoction, stirring often and watching pretty much constantly for around 30 minutes until it has reduced to a pale caramel. You are looking for the caramel to thicken sufficiently to be able to part the mixture in the saucepan with your spoon. Stir in your salt at this point. Remove the caramel from the heat and pour straight onto your shortbread, still in the brownie tin. Once you have every scrap of caramel in one delightfully flat layer, leave this to cool completely again and transfer to the fridge once cool to firm up completely. Melt your chocolate, either in a glass bowl over a pan of simmering water or gently and slowly in a microwave, until no lumps remain. 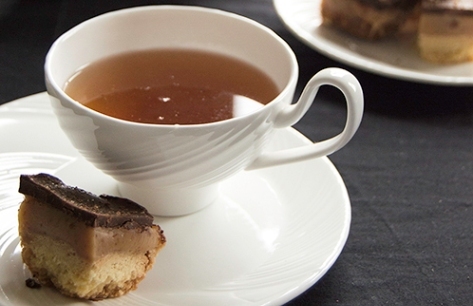 Stir the chocolate for a few moments to cool it slightly before pouring this over your set caramel. Sprinkle some attractive looking salt flakes over the chocolate layer while still wet so that they will stick into the chocolate as it hardens. Leave to cool and harden at room temperature to preserve the shine of the chocolate. You may need to put the finished shortbread in the freezer for around an hour before you attempt to cut slices as the caramel is softly set. Serve at room temperature or fridge chilled. 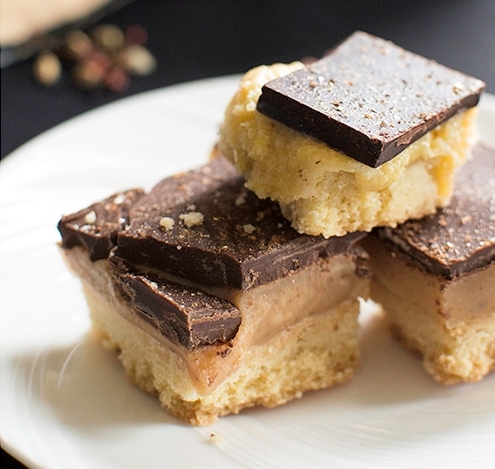 The resulting shortbread is heavenly but the caramel will ooze as you nibble, so ensure that you have a plate or a bib to hand!